As we progress more and more into the social media era, the goal becomes clear: It’s not only about pushing your content to the audience, but publishing useful content, that your audience will appreciate and, therefore, will initiate conversation. Twitter is a real-time medium and with the intimidating limit of 140 characters, some may find it difficult not only to express, but to generate engagement as well. 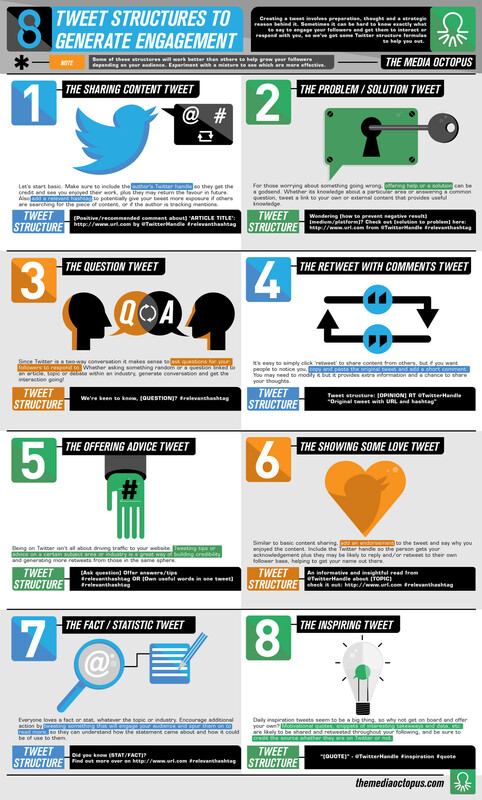 In the following infographic created by TheMediaOctopus, you can see 8 different tweet structures that will help you generate engagement and gain awareness. Check out these 8 different #Tweet structures, that will help you generate engagement. There are 8 main tweet categories: Content Sharing Tweets, Problem/Solution, Question, Appreciation, Fact, Modified Retweets and Stats Tweets. – Whichever category you chose, don’t forget to add a relevant hashtag at the end of you tweet to gain broader exposure. – Do not just hit the retweet button, add your comment and say why you appreciated it. – When your audience asks for a clarification or a question, provide a helping hand, it will be appreciated. – Add Tips and advice to your daily tweet schedule and see your credibility skyrocket. Here’s the infographic. Would you like to add anything more?